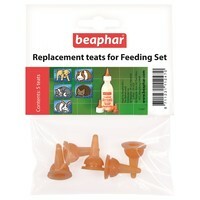 Beaphar Replacement Teats for Feeding Set is a pack of teats to use with the Beaphar nursing and lactol bottles. Excellent to use when feeding orphaned puppies and kittens or small animals, these fantastic teats offer the most natural way of feeding for the animal, helping them to feel more comfortable. Made from durable material, these handy replacement teats are easy use and easy to clean afterwards.